At The University of Alabama, the International Teaching Assistant Program (ITAP) is administered by the English Language Institute (ELI), 101 B.B. Comer Hall. The ELI has conducted ITAP annually since 1982 and semi-annually since 1985.The purpose of the program is to train, evaluate and screen international graduate teaching assistants whose native language is not English. UA requires all non-native English speaking graduate students who accept classroom teaching or other instructional duties to successfully complete ITAP, typically before beginning their duties; however, depending on their English proficiency, some students may be allowed to assume duties while they are enrolled in ITAP. The program includes both the ITAP course and the ITAP Proficiency Exam. The ITAP course focuses on three main areas – teaching methods, American culture, and spoken English. The ITAP Proficiency Exam evaluates course participants on both their general proficiency in spoken English as well as on their ability to handle a classroom or laboratory teaching situation. January 4, 2019 – Two PLACEMENT TESTS for Spring 2019 enrollees: 10:30 AM or Noon , Room 142 B.B. Comer Hall for check-in, students will be called individually for interviews in other rooms. January 8, 2019 – E-mails regarding class place, time & days sent out by 5:00 PM. ITAP students should check their email before the start of class to find out which class they are in. E-mail confirmations will come from marcid@eli.ua.edu, the same e-mail source of all prior ITAP class communication. Students who have received an evaluation of CONDITIONAL PASS by any means, but must have an evaluation of FULL PASS in order to teach. Such students may retake the exam only if they are going to be assigned to teach a lecture-type class. *Students enrolled in an ITAP course during the Spring 2019 semester will be scheduled for a Proficiency Exam as part of the course, and should not be registered again. Program participants are all non-native English-speaking graduate students who will hold teaching assistantships from an academic department at UA and will actually be given instructional duties. These duties include lecturing, conducting a laboratory, conducting a tutorial, etc. The ITAP course is offered each fall and spring semester. Classes meet three hours per week (plus conferencing time). The ITAP course consists of the two modules described below: Teaching Methods (TM) and Oral Skills (OS). OS may be either an 8-week or 16-week class depending on a student’s oral proficiency. TM lasts 8 weeks. Students may not take TM until they demonstrate satisfactory oral proficiency as evidenced by their placement score. Upon completion of TM, students are given the ITAP Proficiency Exam to determine the level of their teaching eligibility. actual practice teaching, which involves having the students teach mini-lessons which are recorded for later review by the instructor and the student together. an understanding of various aspects of American culture which are relevant to academic and social life in the United States. The objectives of OS are twofold. One aspect of this course deals with helping students to become aware of various aspects of English pronunciation, as well as helping them to isolate and overcome individual pronunciation problems which they may have in English. The other focus of this course is on conversation management skills. Students learn how conversation, especially that which takes place in the classroom, is effectively managed within the linguistic and cultural framework of English. The general overall objective of this course is to help students improve their communicative skills in oral English. New Students: Prior to the beginning of the ITAP course each semester, new students are placed into one of the aforementioned modules based on their iBT/IELTS speaking subtest score and/or their results on the oral placement test administered by the ELI. Only students without a valid iBT or IELTS score or students whose scores are borderline will be administered the oral placement test. New students who initially place into TM attend the class for the first half of the semester and take the ITAP Proficiency Exam at the end of the 8-week TM module. New students who initially place into OS are placed into either an 8-week or 16-week class. Students who place into the 8-week OS module attend OS for the first half of the semester and then automatically take the 8-week TM module in the second half of the semester. At the end of the TM module, they are given the ITAP Proficiency Exam. New students who initially place into the 16-week OS module attend the class for the entire semester. They are given the placement exam again at the end of the semester to determine if they qualify for admission to the TM class. If they qualify, they attend the TM class during the first 8-weeks of the following semester and are then given the ITAP Proficiency Exam. Repeating Students: Students who wish to repeat the ITAP course will be placed according to their most recent test results, provided these results are less than a semester old. If their results are more than a semester old, the students will be given the placement test again. The ITAPPE is only given to students who have successfully completed the ITAP course. The OS and TM modules are considered as successfully completed or not based upon class attendance and participation. The ITAPPE is given four times per year: at the end of each semester to all eligible students and at mid-semester to students enrolled in the 8-week TM module. Students may only take the ITAPPE once per semester. The exam has two subtests: the SPEAK test and the sample lesson. SPEAK: This exam tests general speaking and listening proficiency in English. Examinees listen to a recording and are asked to perform tasks such as giving directions, interpreting a graph, describing pictures, and answering open-ended questions about general topics. Responses are recorded and evaluated at a later time. Sample Lesson: Approximately 45-60 minutes before the start of this section of the exam, examinees are assigned a topic from the field in which they will serve as a graduate teaching assistant. Students teach a 7-minute lesson on the assigned topic. Students may develop the assigned topic in any manner they wish. For example, they may choose to give a definition, explain a procedure, describe a process, etc. – anything that simulates what they might be doing if they become a teaching assistant. During the lesson, the “teachers” will be interrupted and asked questions, just as in a real classroom situation. Whiteboards and black markers will be available; examinees may bring ready-made charts or posters to use in their lessons if they wish. Overhead projectors, PowerPoint, etc., will not be available. Each Sample Lesson will be video-recorded for quality control. The SPEAK and sample lesson are each rated on a scale of 60, and the results averaged together to determine the ITAPPE score. Based on their ITAPPE results as well as their ELI instructor’s assessment as to their readiness to handle classroom responsibility as graduate teaching assistants at UA, ITAP participants are given one of three evaluations: Full Pass, Conditional Pass, or No Pass. Full Pass: The student has sufficient language and teaching skills which allow for full teaching responsibility in a lecture-type class. Conditional Pass: The student has problems with certain language and/or teaching skills and should only be given teaching responsibility in a lab or tutorial situation where instruction occurs mostly on a one-to-one basis or in a classroom situation where a senior teacher is present. The student should not be given full teaching responsibility, nor should the student be given teaching responsibilities which involve lecturing as the mode of instruction. No Pass: The student has serious problems with certain language and/or teaching skills and should be given no speaking responsibility in a class, lab, tutorial, or other situations in which the student disseminates information in a formal capacity. NOTE: In some instances students are given a Trial Pass (Trial Full Pass or Trial Conditional Pass). A “trial” recommendation is valid only until the next ITAP exam is given. For example, a “trial” given in December is valid for the spring semester only; a “trial” given in May is valid for either the summer terms or fall semester. The ranges listed above should not be considered as exact cut-off points but rather as suggested guidelines for making final evaluations. While a student needs an average ITAPPE score of 52 for a Full Pass, each subtest score (SPEAK and sample lesson) must be at least 50. Similarly, for a Conditional Pass, each subtest score must be 46 or above. Placement exam and ITAPPE results are posted on the Graduate School Web site. To display a student’s detailed results, the department must click on the student’s name. In addition to individual test scores and final ITAP evaluation, other information, such as permission to teach or conditions placed on a student’s evaluation, may be entered. Departments are responsible for conveying this information as well as exam results to their students. A follow-up observation is conducted of each student who receives a passing recommendation from the International Teaching Assistant Program and is actually given a teaching assignment. At least once during the ITA’s first semester of teaching, an ELI instructor will observe the ITA in the classroom and meet with him or her to discuss the ITA’s performance. Continued follow-up observations are conducted if they are deemed necessary. Students are registered for the ITAP course and exam by their departments. All registration is done through the Graduate School during the designated registration period. Departments are notified of the registration period in a memorandum from the Graduate School. The memorandum also includes general information on ITAP as well as date, time, and place of the ITAP course and exam. Departments are responsible for providing each student they register with this information. Students are registered as NEW, REPEAT, or EXAM-ONLY students. Students who have never taken the ITAP course are registered as NEW. New students are automatically given the ITAPPE as part of the class and thus do not need to be registered for the exam separately. Students who have completed OS but have not qualified for TM retake the placement exam to determine their readiness for TM only if their most recent placement score is more than a semester old. These students should be registered as REPEAT and take the placement exam along with NEW students. Students who have both successfully completed the ITAP course and taken the ITAPPE previously and wish only to retake the ITAPPE should be registered as EXAM-ONLY. Click on the chart to see it in full size. Current and former ITAP students can access language-improvement materials in the ELI Study Center. 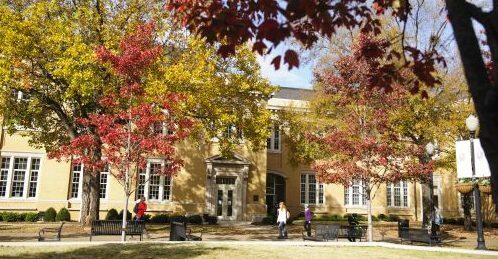 All international graduate students at UA can enroll in the semester-long Graduate Spoken English class at the ELI as well as undergo accent-reduction therapy at the UA Speech and Hearing Clinic. B.B. Comer Hall is next to the Student Services Building, across from the Ferguson Student Center.